A total of 61 people left Death Row permanently, no longer subject to punishment for a crime. The majority, 52, were executed, usually by lethal injection. This was quite a few more than the 37 people executed in2008. But then, the 2008 number was artificially low: events at the end of 2007 led to a moratorium on executions in several states while the Supreme Court debated the legality of lethal injection. The other 9 inmates (nearly 15%) left Death Row as free men, no longer subject to punishment because DNA testing or other evidence proved beyond a doubt that they had not committed the crime for which the death penalty had been meted out. In 2009, juries or judges sentenced 106 accused criminals to death. However, death sentences must be appealed in most jurisdictions, so some of these sentences will likely be changed in the appeals process. Some may even be exonerated. 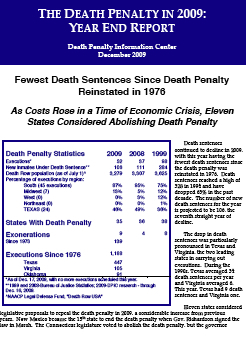 The Washington Post reported these figures in an editorial, calling for an end to this form of punishment which it termed “unnecessary and barbaric.” Their ethical stance did not seem to have a basis in the inherent dignity of each human being, merely in the fact that we showed ourselves to be barbaric in carrying out this punishment – and possibly subject to an irrevocable error. This made it a strange editorial: opposing a practice that ends the lives of many people, yet for reasons unrelated to their inherent worth or, indeed, any aspect of their humanity.